Snippets of Jack: "A Wedding? I Love Weddings! Drinks All Around!" Like just about every pirate, Jack loves rum. How about some more memorable moments? Jack: "Stop! Stop! Not Good! What are you doing? You burned all the food... the shade... THE RUM!" Elizabeth: "Yes, the rum is gone." 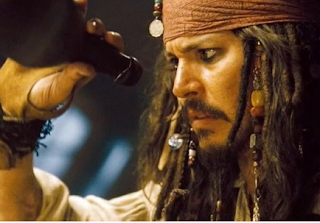 Jack: "Why is the rum gone?" Elizabeth: "One, because it is a vile drink that turns even the most respectable men into beasts and scandals! And two, that signal is over a thousand feet high. The entire royal navy is out looking for me. Do you really think that there is even the slightest chance that they won't see it?" Jack: "But why is the rum gone?" Is there really a bigger picture anywhere besides rum for Jack? Well, with a bottle or with out, we sure do love jack, am I right?